Planning a hiking holiday in Byron Bay? If you go on one of the longer Hinterland hikes in the Byron Bay Area it’s important to make sure that you hydrate, and if you don’t want to use plastic water bottles which aren’t great for the environment, bring along a personal water filter for your hiking adventures. We’ve sourced some of the best personal water filters that come in a range of prices and features. Take a look and see what might work best for the type of hiking you are planning for your holiday. More durable than previous versions of the Lifestraw, which was plastic, the Lifestraw Steel provides a two-stage filtration process. This personal water filter removes 99.99999% of bacteria, 99.9% of Protozoa and reduces chlorine, bad odour and taste plus organic chemical matter. It doesn’t require batteries, heat or chemicals to make it work, and it is a lightweight option for carrying around in a pack all day while you’re hiking. This personal water filter was voted by American Time Magazine as Invention of the Year. It costs $99.95 in Australia, and you can purchase it here. This particular personal water filter utilises UV light to kill off viruses in the water. Typically a battery-operated device, the Steripen now has a rechargable version. This filter is super simple to use, just fill your water bottle from the stream or whatever you’re using for water and place the Steripen in it. When the light goes off, then your water is safe to drink. The Steripen kills off all pathogens including viruses, so the water is safe to drink, but it doesn’t actually get rid of any chunks in the water out or change the taste much. However, for ease of use and throwing in your pack, the Steripen makes a good choice for hikers. You can purchase the Steripen for $182 through Paddy Pallin. This is the gold standard in personal water filters. You’re going to pay a pretty penny for this one, but it’s worth it if you split it up with your regular hiking mates. Plus, it does something that a lot of water filters can’t claim — it kills the viruses. This filter requires you to actually pump water through a filtration system that traps the pathogens. You will need to manually pump the water, but keep in mind the pump typically goes at about 2.5 litres a minute. Easy to use, the Guardian is perfect for a larger group, and since you’ll be paying so much, it might be best to split the cost of this one with several friends. In Australia, it will typically run about $545 on Wild Earth. This personal water filter features a straw just like the Lifestraw, but beyond just the straw, you also can just filter the water into a 500 ml flexible bag. That bag can then be used to drink clean water either directly or to fill up another water bottle that you can then drink from during your hike. Really best for just one person, the Sawyer removes 99.99999 of all bacteria and 99.9999% of all Protozoa. The good news with this one, like the Lifestraw, is the price. It costs less $40. A favourite with a lot of hikers, the Platypus Gravityworks personal water filter works just as you’d think — with gravity. Hang the “dirty” water bag up high, like in a tree or on a rock, or if you have to, you can hold it up. The dirty water gets filtered — taking out most pathogens and chunky stuff — and fills up the “clean” bag. (Bags are clearly marked since you wouldn’t want to mix those up!) This personal water filter come in two sizes, either 2 or 4 litre and works quickly — in about two minutes (if using the 2 litre size) you’ll have clean water to drink. You can purchase the Platypus for about $200 through Wild Earth. 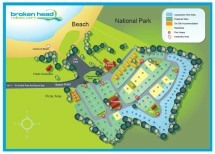 We welcome you to stay at Broken Head Holiday Park during your hiking holiday. Not only do we have excellent communal on-site facilities, we also are located near Bryon Bay without the busyness of the town centre. You get the quiet natural surroundings (including a beach right by the park!) without the constant noise that you might find if you were in Bryon Bay proper. Book your campsite or beach shack today!